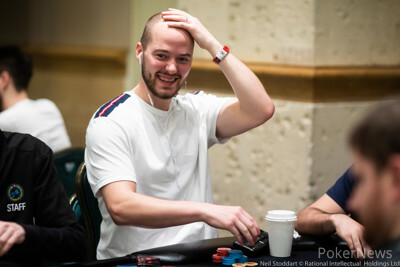 Sean Winter has been crowned the winner of the first $25,000 Single-Day High Roller here at the 2019 PokerStars Caribbean Adventure in the Atlantis Resort after it needed a second day. Winter defeated David Peters after only three hands on the second day to claim the first-place prize of $495,210 while Peters took home $352,040. This win will take his lifetime earnings up to over 11 million in total according to Hendon Mob and will be his seventh largest cash ever. For Peters, this cash will take him close to the 30 million mark. The first Super High Roller of the week attracted 75 entries which also includes 25 reentries. All those entries created a total prize pool of $1,800,750 with the winner walking away with $495,210 whenever the two remaining players will finish the heads-up battle. During the first eight levels of the day, 68 entries were collected with another 7 players jumping in during the 80-minute dinner break. 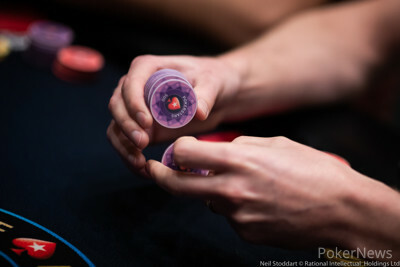 PokerStars Team Pro, Igor Kurganov, Steve O’Dwyer, Joe McKeehen, Isaac Haxton, Joe Cada, Jean-Noel Thorel, and Timothy Adams are some of the players who took their seats in the first level of the day. Cada was one of the first unlucky players who was sent away from his table when he shoved on the trey-queen-seven-five-nine board with king-high and was called by O’Dwyer who held pocket nines. Many more familiar names joined the field just before the first break of the day, including Alex Foxen, Byron Kaverman, Cary Katz, Jason Koon, Manig Loeser, Matthias Eibinger, John Juanda, and Rainer Kempe. When registration closed after the dinner break, it also signaled the end of the reentry period and players were sent to the rail in quick succession. Players like Ramin Hajiyev, Andras Nemeth, Steffen Sontheimer, Benjamin Pollak, Bryn Kenney, Elio Fox, Daniel Dvoress, and Ben Yu were all eliminated without cashing. The bubble lasted almost two hours as only eleven players would be in the money for at least $45,020. Peters increased his chip lead when he shoved on O’Dywer who let his hand go on the river. Kaverman found a double through Ivan Luca with pocket tens while Luca held eights. 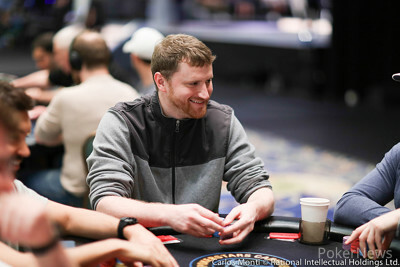 Foxen tripled up with ace-queen against the jack-six of Winter and then the bubble finally burst when Jonathan Kamhazi finally put his last 10,000 in after having blinded down for a while and busted to Jack Salter. Kamhazi’s king-four couldn’t beat the king-nine of Salter as Salter had the higher kicker. Once the bubble burst, there was a flurry of action on both tables with Foxen being the first to cash when he ran ace-four into Winter’s ace-king. Erik Seidel was next to go when his jack-nine got no help from the board against Peters’ ace-king. With nine players left, it was time to combine the remaining players onto the final table. Kaverman’s king-nine call when Kurganov shoved with king-queen on the flop didn’t earn him a double up as he was the first to leave the final table. Kurganov himself flopped top pair with ace-jack on the five-trey-jack-four board and decided to bet and call the shove of Peters. Unfortunately for the PokerStars Team Pro, Peters had the overpair with kings, and no ace or jack came on the river to save him. Stanley Choi was taken down by Salter when his pocket eights got rivered as the ace came while Salter held ace-jack. O’Dywer’s king-jack were beaten by the king-queen of Winter, and then it was time for Luca to go when he ran king-six into the tens of Kempe. Kempe tried bluffing Peters and lost a huge chunk of his stack and then the remainder also got added to Peters’ stack when he shoved his last eleven big blinds with ace-four. Peters had called with queen-nine and made trips on the river to take the German out in fourth place. Salter’s run was over a mere five minutes later when he called with his last chips with queen-nine when Winter had put him all-in with queen-trey. The queen-four-trey-trey-nine board did not help and Salter was happy to have managed to pick up quite a few pay jumps after having been short for quite a while. Heads-up play lasted for around 90 minutes with Peters and Winter swapping out the chip lead and doubles back and forth. In the end, they had to bag up their chips as the tournament room was closing on the first day. They agreed that they wanted to play the $50,000 Single-Day High Roller first before closing out this tournament and decided to delay it for another day. In the end, they both decided to finish the tournament on January 10, after play ended in the $100,000 Super High Roller. Once it was time to start, Peters managed to double up in the first hand with five-deuce when he had flopped two pair and his shove was called on the river by Winter who held nine-five. In the second hand, Peters shoved on the button with nine-eight and Winter called with king-jack. Winter managed to double back up with the higher hole cards. In the third and final hand of the night, Winter had limped on the button and Peters went along. Peters check-called the continuation-bets of Winter on the seven-trey-queen flop and the ace on the turn. The eight came on the river and now Peters tank-called Winter’s shove with seven-deuce for Winter to claim the win with eight-seven as he had rivered the two pair. They shook hands and as quick as they came to finish the tournament, just as quickly they left the poker room via the payout desk to collect their cashes. This concludes the coverage of the first Single-Day High Roller here at the PCA with two more to come over the next few days so make sure to keep following the updates provided by the PokerNews live reporting team. Sean Winter limped in on the button and David Peters called. The flop came , Peters check-called the 160,000 bet of Winter. The turn brought them the , Peters now check-called the 250,000 continuation-bet of Winter. The river completed the board with the , Peters checked for the last time. Winter shoved, having Peters covered. Peters dove into the tank, using two time bank cards, and then decided to make the call with for the flopped pair of sevens. Winter won the hand and the tournament in the third hand of the heads-up tonight with as he had rivered two pair. A full recap of the tournament is to follow. David Peters shoved on the button and Sean Winter snap-called for the 2,740,000 he had left. The board ran out for Winter to double back up with the higher hole cards. In the first hand of the night, Sean Winter called on the button and David Peters opted to check. They both checked through the flop to the on the turn. Peters bet 400,000 and Winter called. The river completed the board with the , Peters shoved and Winter dived into the tank. After using two time bank cards, Winter called. Peters tabled for the flopped two pair while Winter held for just one pair fives so Peters would double up immediately. The heads-up has now started with the button on Sean Winter. The start of the heads-up has been delayed slightly as the players and organization are trying to figure out who should start on the button. Sean Winter and David Peters will be finishing their heads-up battle at 10:10 PM, just after the finish of the $100,000 Super High Roller. Sean Winter is going into the heads-up with a lead as he bagged 5,120,000 in chips which is 32 big blinds while Peters has 2,380,000 which is around 15 big blinds. They are returning to play Level 23 which features a small blind of 80,000, big blind of 160,000, and big blind ante of 160,000.
Who will take it down, follow along as the PokerNews live reporting team will be there to bring you all the updates until the winner has been crowned.